Convenient and portable - ideal for use in the home, school or office. Multi-tasking is easy with the built-in staple remover and unique staple storage compartment - so you're always prepared. Durable - strong plastic construction. Stylish colors - blue, pink, and grey. Pre-packed with 1,000 Standard Staples. Staples 2 - 12 sheets of 20 lb. paper. Please Note that the choice of color you receive is based on availability at the time of shipment, specific color selection is not available. Pros: Handles Large Volumes; Compact Design; Easy To Use This is the great stapler for school backpacks. The price is right. The size doesn't take up so much space in the backpack. My Chem Professor had one. I definitely have to buy one. I love them. They are convenient to carry around and they can staple some thick papers for its size. You won't be disappointed. Great gift for the children for school and college. Lovely bright colors! Welcome to MyBinding video. 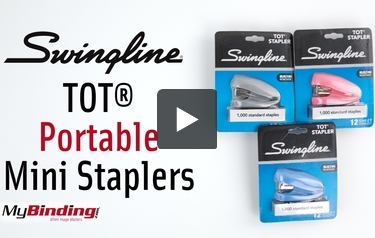 Today we look at Swingline’s TOT Portable Mini Staplers with the grip and the standard model. With many fun colors to choose from, these mini staplers can fit anywhere – your pocket, your purse, your desk, anywhere that you might need it quick and easy. Each one comes with its own box of staples and is easy to load. Simply lift the lid, place the staples in, close it up, give it a snap and you’re on your way. Use it with your fingers ,the palm of your hand, squeeze tight, no problem. The grip model of the TOT stapler comes with its own staples as well, but these are colored bright staples and a thousand of them. Easy to load, same way. It’s a little bit wider, little more grip and little more stylish. Both models use standard staples and Swingline has a great line of color bright. There it is, happy stapling. That’s the TOT stapler. For more demos, reviews and how-to’s, check out MyBinding.com. Transcript: Welcome to MyBinding Video. 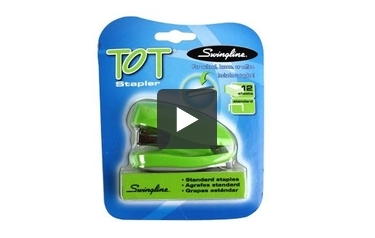 These are the Tot Portable Mini Staplers from Swingline. These cute little staplers can go anywhere you need them to. They’re perfect for home, school, or the office. They come with a pack of 1000 staples, they’re easy to load, and the compartment underneath can hold an additional strip of staples. They can fasten 12 sheets of paper with minimal force and the staple remover on the back side is just as useful. They’re available in these three colors and come with a 1 year warranty from Swingline. For more videos and all your binding needs, visit MyBinding.com. Welcome to MyBinding Video. These are the Tot Portable Mini Staplers from Swingline. These cute little staplers can go anywhere you need them to. They’re perfect for home, school, or the office. They come with a pack of 1000 staples, they’re easy to load, and the compartment underneath can hold an additional strip of staples. They can fasten 12 sheets of paper with minimal force and the staple remover on the back side is just as useful. They’re available in these three colors and come with a 1 year warranty from Swingline. For more videos and all your binding needs, visit MyBinding.com.